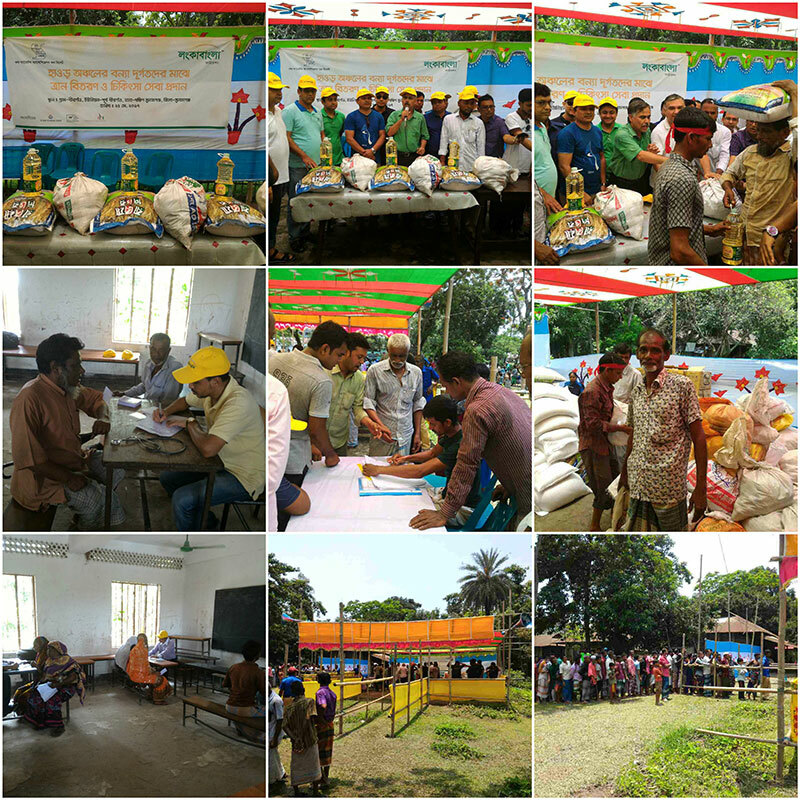 LankaBangla Foundation and Old Cadets’ Association of Sylhet (OCAS) jointly undertook a relief distribution program and medical camp among flood victims of Birgoan village of East Birgoan Union, Soouth Sunamganj Upazila, SSunamganj on 25 May 2017. Relief materials were distributed among 750 families of Birgoan viallge. Relief materials included rice (20 kg), pulses (2 kg), soyabean oil (2 lit), cheak peas (1 kg), potato (5 kg), onion (3 kg), sugar (2 kg), salt (1 kg) and medical facilities with free consultation & medicines from volunteer doctors. LankaBangla Foundation as part of its CSR activities every year extended support for health, education & environment sectors and undertakes different projects and programs. This time jointly with OCAS distributing relief materials and facilitating medical camp for flood victims of 750 affected families of Birgoan viallge of South Sunamganj. Considering the present abject situation of flood victims Management of LankaBangla Foundation jointly with OCAS have distributed these relief materials among flood victims as part of its CSR activities. Besides, Cadet College Club Limited (CCCL), Cadet College Club Chattogram (CCCC) and All Cadet College Club Limited (ACCL) extended their support in this good cause. From LankaBangla Head of Alternative Delivery Channels (ADC), Mr. Md. Jahangir Hossain; Mr. Tashrif Haque, Head of Branch, Sylhet and from OCAS Mr. Shakil Ahmed, President; Mr. Ishtiaque Ahmad, Vice President and Mr. Md. Ataullah, General Secretary & other officials, doctors, volunteers and local authorities actively participated in the relief distribution program and medical camp.